Free fall feels nothing like a fall at all. I know, because I just paid a dude named Ian $209 to shove me out of an airplane from 18,000 feet in the air. In the moments leading up to our leap, adrenaline pumped through my veins harder than Arnold Schwarzenegger and Lou Ferrigno ever pumped their iron. For years I have entertained the notion of skydiving with casual complacency. I always hoped that my happy hour boldness would be taken like tequila, with grains of salt. And then I had a pacemaker implanted and was told of the things I could no longer do. I could no longer put my cell phone in my left breast shirt pocket. That was fine because none of my shirts have breast pockets. I could no longer scuba dive. That was okay because I have been on a dozen dives and we cannot actually confirm the whereabouts of the shark from Jaws. I could no longer participate in contact sports. That was a bummer because I harbor fantasies about becoming a roller derby queen. I could no longer skydive, and that, well that sucked. I felt regret for all the time I spent between contemplation and determination, for the action I never took. I begged my doctor to research the impact of skydiving on pacemakers in relation to my particular conditions. Little to no research exists, though I did eventually get a letter clearing me for takeoff. Once my choice was official, angst and anxiety took flight. My apprehension only increased when my first scheduled skydive was cancelled due to weather. Weeks of emotional preparation crashed and burned. Panic endured. Yet I was determined to be bold, to be brave, and to be okay with being afraid. And afraid I was up until the second I stepped to the edge of the plane. I gaped below at Earth, outstretched in its vastness and unyielding in its beauty. Troublesome things from the ground were nowhere to be found. The instant right before I was heaved from a fast moving plane was an instant of complete stillness and absolute peace. I felt fearless, outright unaware of the second before, devoid of anticipation for the second to come. And in the second to come I was free-falling with gravity as the only force acting upon my body. I fell at a speed of 147 miles per hour for 50 seconds, a sensation that felt like floating on a cottony cumulus cloud. The immense Rocky Mountains looked as if someone painted a miniature version of them for a shoebox diorama. The parachute opened and ten gorgeous, glorious, tranquil, unbelievable minutes ensued. My feet landed on the ground without so much as a thud. Had I not suffered through panic, and trust me there was lots, I never could have appreciated such a spectacular adventure. If the question is why I chose to fall from an airplane, the answer lies within learning how to best tolerate fear for the unknown of which life is rife with. I only had to suit up, to breathe, and to leap in the moment that it felt most terrifying to do so. 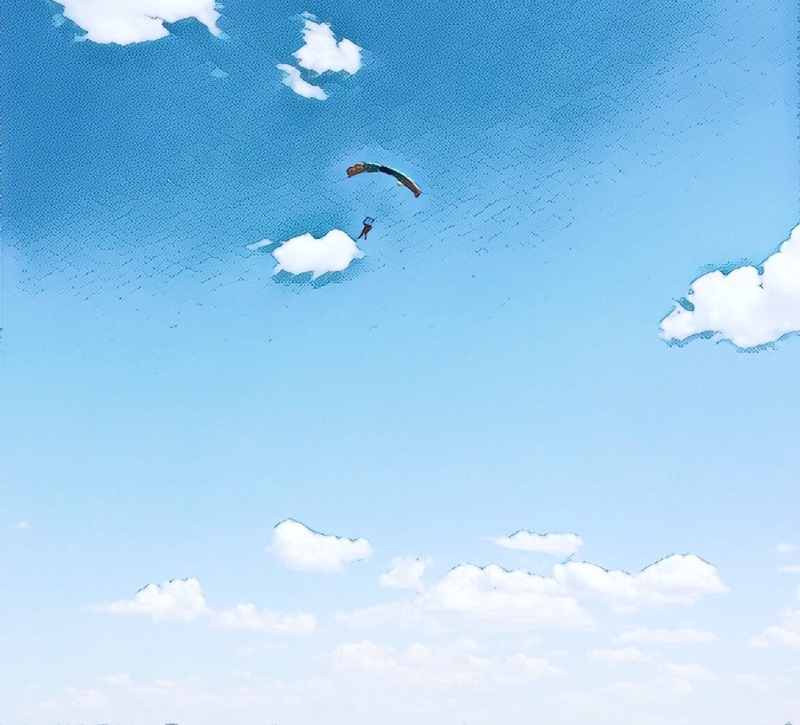 In this way skydiving does not feel like an extreme hobby but rather a gentle reminder that although life is full of unpleasant things to endure, it is just as full of thrills to savor. My heart rate increases just thinking about being up that high. (The same thing happens when I watch videos on Youtube of people scaling skyscrapers and those giant antennas. I’m not sure why I watch these videos.) I’m glad you enjoyed it! Good for you! What a brave and beautiful thing to do. Wow!! So many wows I have! First, I can’t believe it’s only $200. Second, what an incredible adventure! It sounds amazing and how cool that you got to experience it despite the uncertainty with your pacemaker. Thank you for sharing the feeling with us. Subscribe to The Banshee and receive notifications of new posts by email.